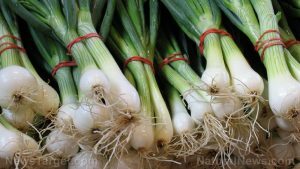 Also known as green onions or young onions, scallions are a part of the allium family, alongside garlic, shallots, leeks, and onions. They have a white, slightly round base and long green stalks that go from light to dark green towards the tip. According to TheSpruce.com, they are available all year, but most especially in the spring and summer. Scallions have a milder flavor compared to onions, and are used in many different cuisines to add flavor to dishes. They are used raw as a garnish, though some recipes also feature them cooked. Scallions are a highly nutritious vegetable that provide many health advantages. According to DrHealthBenefits.com, scallions promote eye health. They contain a good amount of vitamin A, which stimulates the production of the protein rhodopsin. Rhodopsin facilitates the absorption of light by the retina, improving vision and preventing night blindness, cataracts, and corneal ulcers. They can boost the immune system, due to the generous levels of phytochemicals such as anthocyanin and quercetin. These flavonoids are also linked to the prevention of cancer by protecting against free radicals in the body. In particular, vitamin A combined with flavonoids such as lutein, carotene, and zeaxanthine also found in scallions are effective in preventing lung cancer. Scallions promote heart health as they contain vitamin C, which can help lower blood pressure, in turn lowering the risk of heart disease. They also contain allicin, which helps stop clots from forming as it eliminates stiffness in the blood vessels. Consuming scallions regularly can help prevent diseases caused by blood clots, such as coronary heart disease and stroke. Vitamin C and allicin together also promote healthier skin, preventing skin aging and wrinkling while increasing the tone of the skin. Scallions contain a good amount of vitamin K, which, along with vitamin C can fight bone diseases such as arthritis and osteoporosis. Sulfur, which is present in significant amounts in scallion, can help lower blood sugar levels and increase insulin levels. This makes the vegetable a good supplement for managing diabetes. The vegetable’s anti-viral and anti-bacterial properties make it effective in treating respiratory problems such as the cold and flu. It can also prevent allergies, asthma, and sore throat. Scallions have been used for centuries as a remedy for swollen feet, due to the sulphur and quercetin which work to alleviate the swelling. The combination of iron and vitamin C in scallions can be a remedy for tiredness and fatigue. The folates in scallions are very beneficial for pregnant women as well, preventing birth defects in their infants while they are in the womb. While often chopped up and used as a garnish for most dishes, scallions can also be the main ingredient in a dish. As Saveur.com suggested, scallions can be included in soups, salads, noodle dishes, and fish dishes. They can also be deep-fried in batter or roasted on their own with miso dressing to make a delicious appetizer. Scallions can prevent against cataracts, night blindness, and corneal ulcers. They boost the immune system. Scallions can protect against cancer, particularly lung cancer. Scallions can prevent heart disease and regulate blood pressure. Scallions can also reduce the risk of stroke. They can keep the skin young, and prevent arthritis and osteoporosis as well. They are good for managing diabetes. They can treat respiratory problems including colds, the flu, asthma, and allergies. Scallions are a known remedy for swollen feet. They can be used to alleviate tiredness and fatigue. Scallions can prevent birth defects in infants in their mothers’ womb.